What makes a good training workshop? It should be engaging, interactive with useful take home and deliver what it says on the can. Writing Keeping Dry and Staying Warm has been has been based throughout on dialogue. There has been over 3 years of research and writing in collaboration with Chuck Kukla (our USA editor) and Chris Townsend (renowned TGO – gear tester). This has also involved a dialogue with 15 outdoor brands, and key independent retail stores, Climbers Shop/Joe Brown and leading mountain professionals, including Steve Long and Rob Pugh. Email dialogue and face to face meetings is not the same thing as a live workshop.Could we apply our decade of experience of running innovation workshops for students and businesses at Lancaster University to Keeping Dry and Staying Warm? 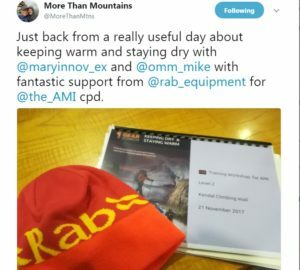 Rob Pugh, AMI secretary and North West Regional Representative has been reading Keeping Dry and Staying Warm and giving us valuable feedback since 2015. Back then he thought there was potential for a workshop when we were ready. He suggested this again this summer and our first workshop for AMI/BAIML/IFMG, mountain guides and instructors took place on 21 November attracting 26 participants, a fine testing ground for our approach . The day long workshop was supported by a workbook, by a set of samples/tools, and a set of highly interactive sessions led by Mike Parsons. 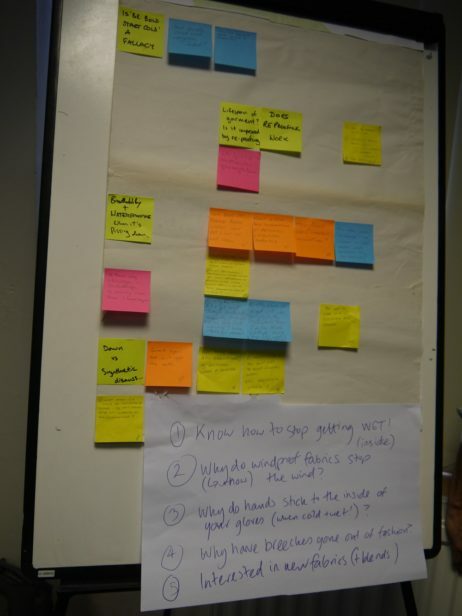 Starting by asking people what they had never understood about Keeping Dry and Staying Warm set the lively tone of the day with subgroups of people discussing and feeding back to us the whole group via post-its. Food is the only reliable heat source when out in the wilds. So how our bodies create and maintain heat and how we gain or lose heat from our garments and surroundings are key issues. Layering 2 What garments are made of, the key polymers and textile types. Wind-proofing. The key differences,what they do and don’t do. Layering 3.Moisture management, beading of water and capillary action. In workshop conclusions we returned to the questions raised at the start to see how dealt with. Sounds like a packed day and it was but the level of engagement kept the Adrenalin going throughout. We learnt a lot from the day which reinforced our belief in discussion as a key to learning and about the use of practical examples that draw on people’s experience to keep the day alive. 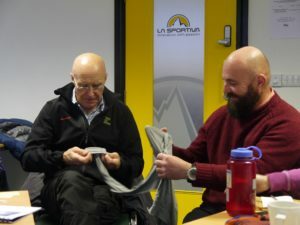 The feedback convinced us that we have engaging material on Keeping Dry and Staying Warm that was valued by a diverse group of mountain professionals. 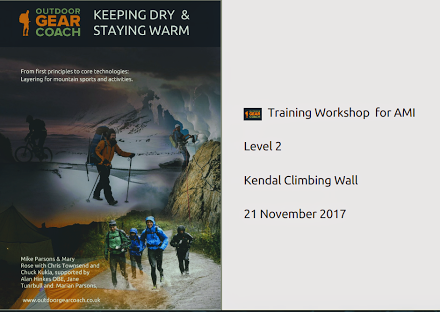 Having Brian Ward from Climbers Shop, Ambleside, with whom we have worked so closely and creatively, was an added bonus because he was able to experience what a workshop could achieve. 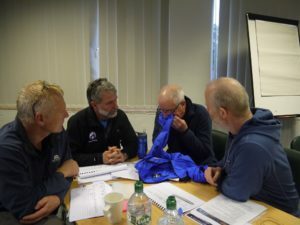 Everybody agreed that the day was incredibly useful, not just for reviewing our own kit but also in gaining more knowledge that we can pass onto our clients when it comes to choosing the appropriate layers depending on their body type and level of activity. 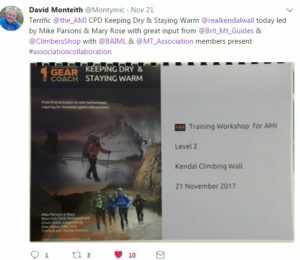 Normally Professional Mountaineer don’t carry workshop reviews but made an exception for Keeping Dry and Staying Warm describing it as a ‘remarkable cross association pilot event about a subject that affects us all -clothing for mountaineering activities’ . 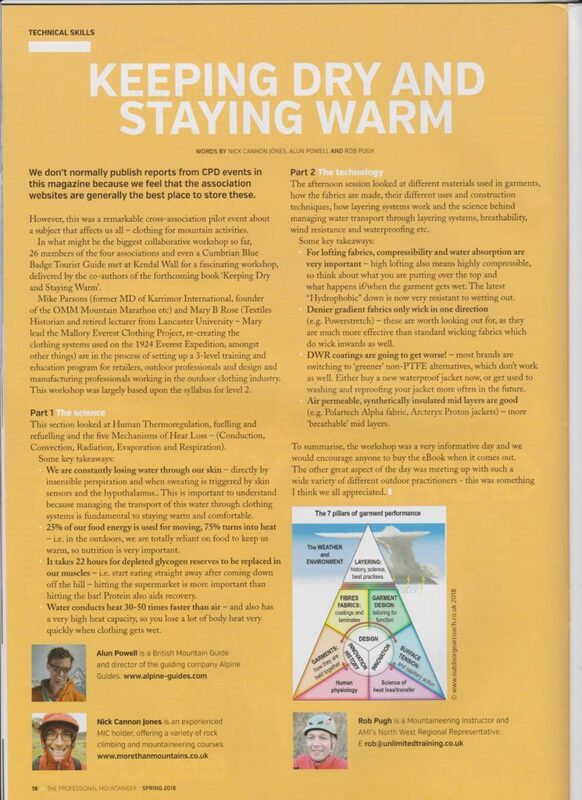 Alun Powell, British Mountain Guide, Nick Cannon-Jone MIC and Rob Pugh AMI wrote a full page spread about the workshop, concluding that ‘the informative day would encourage anyone to buy the forthcoming e-book.